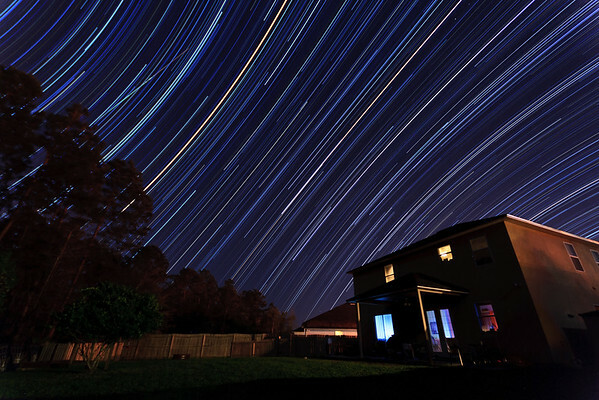 This is a photo of star trails that I made in my backyard. This gallery contains all 445 images that were used to create the composite. Before creating the final composite, I looked at each image and cloned out any airplane trails, and darkened some things in a few of them that were little too bright to include in the final product. I did leave the shooting star, though...I considered that a bonus. :) It is in image number 252 . Also for fun I put together a time lapse video of all the images in succession (I left all the airplane trails in for this) The finished product contains the same EXIF data as the final image, and the EXIF for each individual image is below. Thanks for looking! If you are interested in photographing star trails yourself, check out our article, How to Photograph Star Trails! Underneath a Starry Sky Star Trails in our backyard on 03/11/2011-03/12/2011. This is a combination of 445 30-second exposures, from 11:16 pm until 3:21 am. If you are interested in photographing star trails yourself, check out our article, How to Photograph Star Trails! Hey, how did you put the time lapse video together? I can't get the rendering settings right ( I use photoshop ) and I end up with a file either too large, with reduced quality or a video that doesn't play smoothly. Also, 30s exposure aside, what were the other settings? Love the composite photo. Why are the star trails different colours? I just saw your comment. I had the same problem. I used a class 10 sdhx card. I am using canon 600d with 18-55 mm lens for star trails. Also taking back up and formatting your card helps for fast storing of photos. Especiall when you are about to click such 500 pics in burst mode it is advisable to empty your card. Hope it helped you. First of all, I appreciate your response. More times than not, no one responds to my comments. I have been playing around with camera settings all week and, while I was aware I could turn the function off, I did not think to turn the "image noise reduction" off until yesterday. With the noise reduction switched off, sure enough, that eliminated the delay between shots. Not sure how that will affect the overall image quality in the end, but with the camera that I have, I think that's the best I can hope for. I have, indeed, read your article on how to photograph star trails and of the many that I have read on the subject (at least 10+) yours was by far the most helpful and, subsequently, led me to this photo gallery. I appreciate the time and effort that it took to compose the article and put this gallery together as I am sure many others are too! It has provided a great starting point to explore star photography. Hi Jake, I don't use an intervalometer, I set the camera to continuous burst mode and set the shutter to 30 seconds and use a wired shutter release to lock the shutter button down, so it continues to shoot over and over, with minimal time between shots. I've played with an intervalometer, but so far the shortest interval I've been able to achieve between shots is 3 seconds, which can be way too long, especially for a shot facing toward the east or west, like the one above. I believe some cameras have "long exposure noise reduction," which occurs after an exposure is made, and generally takes the same amount of time as the exposure. I'd check and make sure you have that set to off. Have you had a chance to check out my "How to Photograph Star Trails" article? It may answer some more of your questions: http://www.jamesvernacotola.com/Resources/How-To-Photograph-Star-Trails/12233655_6n3up Thanks for coming to check out my site, and good luck! I was wondering if you could list your intervalometer settings (specifically the interval time between shots). I have been experimenting with long exposures and the biggest issue I have had is the time it takes for my camera to "write" the image to my memory card (if I take a 30s exposure, it will take approx. 30s for my camera to "write the image" before I can take another shot). I am fairly certain this presents a significant handicap in regards to my ability to generate nice star trails. I think that if I had your intervalometer settings to use as a base, I would have a fairly good idea of how to manipulate my camera settings to get it as close to yours as possible. All site content copyright © James Vernacotola 2006-2019. All downloadable imagery is for personal use only.